Let's talk kitchens! I am most excited about this room for many many reasons... primarily because the kitchen I've been living with for the past 6 years is completely useless. I can't wait to have a functioning space where I can finally cook a meal without wanting to rip my hair out. It's going to be a dream to be able to host people comfortably, I can't wait. Here's the plan, NEW EVERYTHING!! Continue on to find out the glorious plans for my future kitchen as well as some photos of what's there now! First off, floors, they are going to be the same as the living/ dining area since it will be one continuous space. I'm really loving the natural matte European white oak look lately and the black knots are right up my alley. They just feel so lux and chic. When it came to the flooring I did some serious research, I must have ordered over 2 dozen samples till I found the perfect color. After months of searching I finally found these European White Oak from Monarch Plank (in Foxley) at Melrose Carpet. As soon as I saw them I knew they were exactly what I had been searching for. Next, cabinets! I originally thought I would be going with white cabinets, but when I saw the Laxarby doors in black I knew they would make a bold statement. The dark cabinets would be a nice contrast against the bright white walls. Backsplash and counter tops were easy... Ceaserstone! I've been obsessed with this product since the second I laid eyes on it. I've used Ceasarstone in literally almost every single one of my projects, both commercial and residential. It's amazing, durable, chic and so clean and simple. I've used almost every color they have produced over the last 10 years in varying ways including bathrooms, bars, kitchens, and even on furniture. I knew that when I finally had my own kitchen I would use Ceaserstone. They recently came out with a new finish called Calacatta Nuvo which is just stunning, it most resembles Carrera marble. The light color stone with the darker veins is going to look amazing against the black cabinets. Next detail... faucets. I've been dreaming of a gold hardware kitchen forever so I knew I NEEDED to have gold faucets, it was a matter of life and death actually. I really wanted the faucet to have that clean modern look to contrast the more traditional finish which I think makes it more contemporary. When I saw the Delta Trinsic in Champagne Bronze I was so excited. I knew that that particular facet was exactly what I was looking for. I also love the Touch 20 technology which is a nice option when you have a little baby in your arms. Then we will need new cabinet pulls, these have to be gold as well... obviously. I searched high and low for a simple gold pull, and when I stumbled upon these from School House Electric I knew they were the ones. They were slightly more than I wanted to pay, but I pulled the trigger anyway because, to be honest, there were no other comparable options. Appliances were a tough one for me. I really wanted everything to match and be really simple and clean without spending a fortune. Ideally I would have loved to use the KitchenAid Black Stainless appliances, which are gorgeous, but they didn't have all the items I needed in the same finish, so I opted for the regular stainless. I love the clean professional look of the KitchenAid appliances and they had all the pieces I needed and in the right dimensions so... done and done. Paint was simple, I'm a huge sucker for a good white paint, and Benjamin Moore Simply White has been my go-to for years. Ironically Simply White happens to be the Benjamin Moore color of the year for 2016 which is so freakin' fabulous. Last, we have chairs and drapery to finish off the look. I'm hoping to use 3 of my frame stools in the brass finish for the kitchen island which I am so stoked on. I can't wait to finally have my own designed pieces in my home, it's going to be amazing! And for the window coverings I think just a simple white roman shade will keep a fresh modern look. 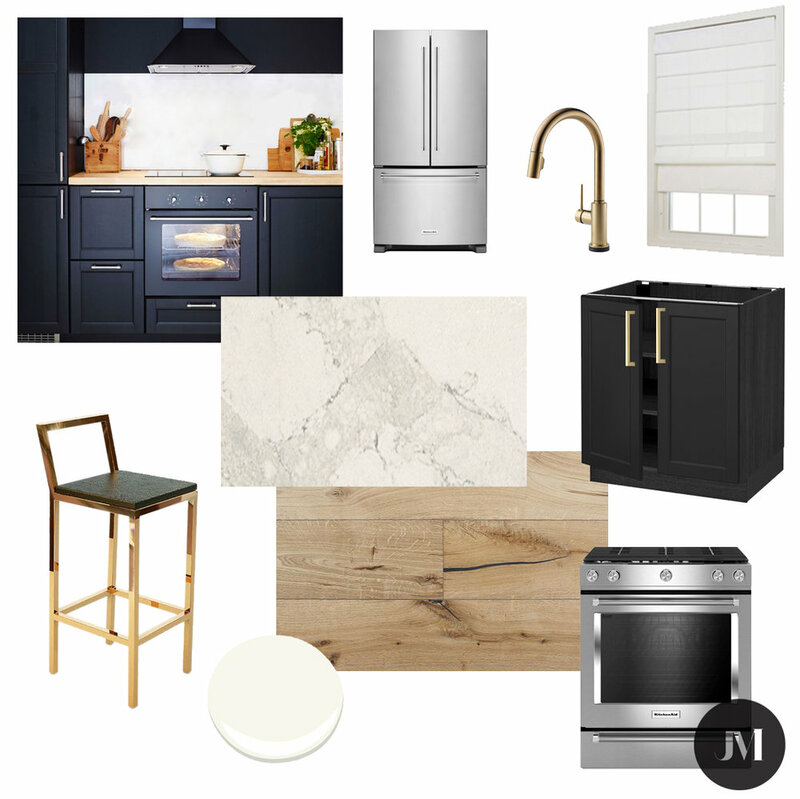 And there you have it... my #kitchengoals for #jmablackswan. Don't forget to follow along on instagram to get more "in progress" photos. On a side note, if you are in the LA area and need help searching for plumbing and appliances Furgeson is a great resource. They have tons of samples for you to see and feel in person. Jessica Mancini at the Woodland Hills location was especially wonderful, just tell her I sent you ;).